Welcome Home Series<sup></sup> handle sets are the perfect addition to your front door to create a unique and fashionable entryway to your home. Each is stylishly designed to provide maximum-security protection. There are many styles, finishes and configurations from which to choose. The straight styling of the Aspen lever creates an elegant, contemporary feel This privacy knob/lever is best used in interior bed and bath applications where privacy is required. Both knobs/levers are locked or unlocked by turn button inside. The outside knob/lever can be unlocked by an emergency key. The crisp, clean appearance of the Satin Nickel finish adds to the overall look of the product and brings a modern feel. Collections by Weiser offers five handlesets to choose from. These handlesets offer solid forged brass construction and Grade 1 cylinders for uncompromised security. With a touch of the coast, Avalon's sweeping curves provide a heightened sense of style. This privacy knob/lever is best used in interior bed and bath applications where privacy is required. Both knobs/levers are locked or unlocked by turn button inside. The outside knob/lever can be unlocked by an emergency key. The crisp, clean appearance of the Satin Nickel finish adds to the overall look of the product and brings a modern feel. 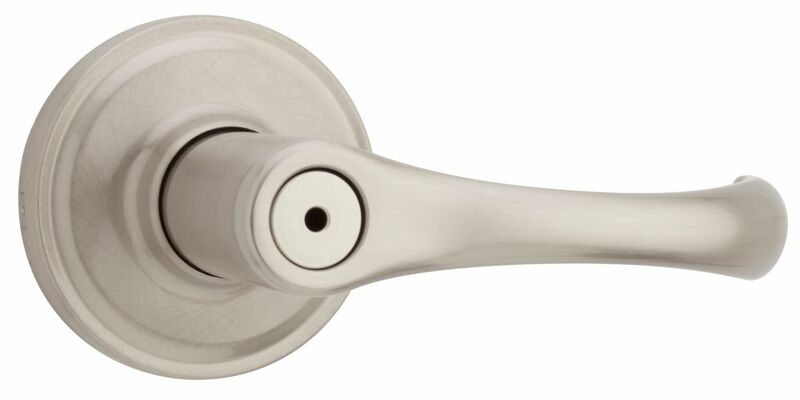 Aspen Satin Nickel Privacy Lever Welcome Home Series<sup></sup> handle sets are the perfect addition to your front door to create a unique and fashionable entryway to your home. Each is stylishly designed to provide maximum-security protection. There are many styles, finishes and configurations from which to choose. The straight styling of the Aspen lever creates an elegant, contemporary feel This privacy knob/lever is best used in interior bed and bath applications where privacy is required. Both knobs/levers are locked or unlocked by turn button inside. The outside knob/lever can be unlocked by an emergency key. The crisp, clean appearance of the Satin Nickel finish adds to the overall look of the product and brings a modern feel.